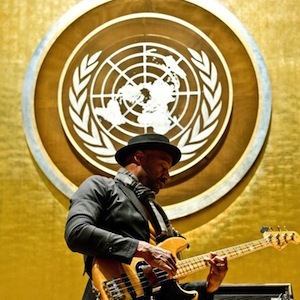 On March 22, 2013, two-time Grammy award-winning artist Marcus Miller hosted and performed at the United Nations in a concert as part of events leading up to The International Day of Remembrance for the Victims of Slavery and the Transatlantic Slave Trade (25 March). The theme of the 2013 International Day was “Forever Free: Celebrating Emancipation,” and paid tribute to the struggle for emancipation of enslaved peoples across the world. Steel Pulse, Somi, Benyoro and the National Ballet of Cameroon also performed, and Monique Coleman introduced the performers. See Paste photographer Doug Seymour’s photos as he captured moments during rehearsal and the concert.